A novel method for direct laser writing of two-dimensional cadmium sulfide (CdS) semiconductor nanoparticle microstructures is reported. A two photon or a higher-order multiphoton absorption process, originating from femtosecond laser pulses, was used to decompose CdS precursors dispersed in a zirconia thin film previously dip-coated on a glass substrate. The kinetics of nanoparticle formation as a function of laser power were monitored in situ by photoluminescence spectroscopy. Raman spectroscopy was also performed to characterize the structural changes of the zirconia matrix under irradiation and to verify the formation of CdS nanoparticles. 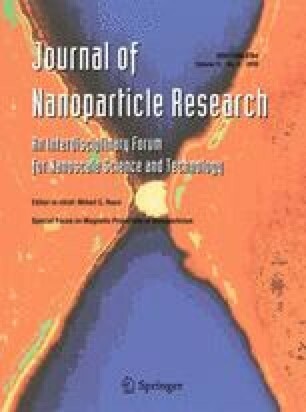 Results show that CdS nanoparticles were formed by two-photon absorption (TPA) with or without the help of an additional carbazole photoinitiator. This study has been partially supported by the Agence Nationale de la Recherche and, more particularly, the PNANO (national Program in Nanosciences and Nanotechnologies) project POMESCO (Organized Photo-growth of Metallic and Semi-Conductor nano-objects intended to Optic devices). K. Raulin wishes to acknowledge the financial support of the French Minister of Research and Education.